OpenRoad Auto Group, B.C. 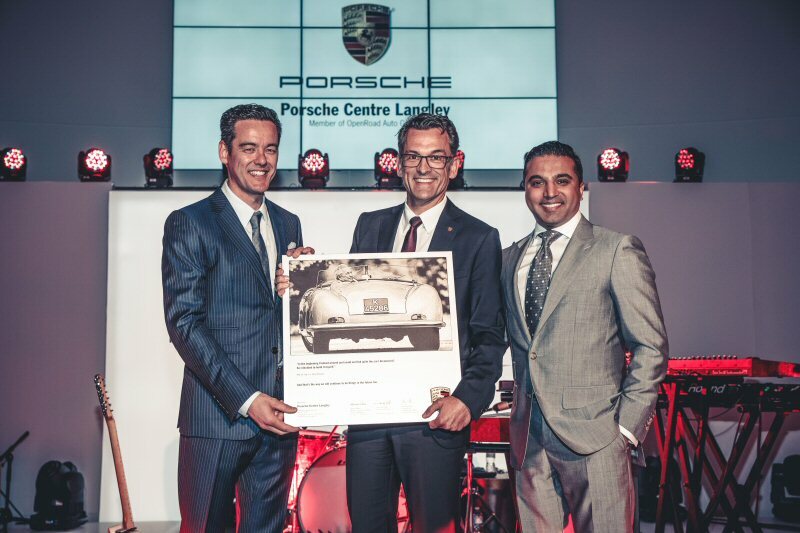 's largest volume dealership group, marked the grand opening of Porsche Centre Langley yesterday with an exclusive event that showcased the iconic heritage and premium culture that is Porsche. More than 400 VIP guests attended the marquee celebration which featured a spectacle of live stallion horses, interactive staging elements, and an exclusive performance by Juno-award winning artist, LIGHTS. The elaborate event also featured a $1.3 million Porsche 918 Spyder, the fastest production road car in the world, plus a spectacular line up of vintage Porsche models. The evening's presenters included Alexander Pollich, President and CEO of Porsche Cars Canada; Christian Chia, President and CEO of OpenRoad Auto Group; Aly Jiwani, General Manager of Porsche Centre Langley; and Mayor Ted Schaffer from the City of Langley. "We congratulate Porsche Centre Langley and its team for the opening of their new point and welcome them to the family," said Alexander Pollich, President & CEO, Porsche Cars Canada, Ltd. "The greater Vancouver area is one of the markets around the country that has helped the brand grow substantially. As such, we are pleased to now offer our customers an address in Langley." Porsche Centre Langley opened to the public in November 2014 and is the Fraser Valley's first certified Porsche dealership and one of only two Porsche sales and service centres in the Greater Vancouver area. The ultra-modern 42,000 square-foot building features Porsche's latest facility design concept and is situated within the Langley Auto Collection, a luxury auto mall owned and operated by OpenRoad which includes dealerships for BMW, MINI, Infiniti, Audi and soon, Jaguar Land Rover. "We're thrilled to have been given the opportunity to partner with Porsche Canada to bring one of best brands in the world to the Fraser Valley," said Christian Chia, President and CEO of OpenRoad Auto Group. "Our goal is to offer more than just a great Porsche sales and service centre. We're fully committed to creating new opportunities for motorsports enthusiasts in B.C. while building a unique community of people who are passionate about Porsche's beautifully engineered, high performance cars and a best-in-class experience." Visit www.porschelangley.com for more information. Pictures from the event are available on the photo gallery. For additional high resolution event photos and post-event interviews, please contact Tanis Sullivan at (604) 230-8008 or tanis@tanissullivan.com. In 2000, OpenRoad Auto Group formed to offer car buyers and owners an experiential automotive retail service. With sales and service in multiple languages, OpenRoad Auto Group encourages a car buying experience based on openness, participation and expertise. One of Canada's 50 Best Managed Companies, CADA Laureate and the recipient of multiple Canadian Best Employer Awards, the OpenRoad team of over 800 associates represents 12 import brands at 15 dealership locations across B.C., Canada. Visitwww.openroadautogroup.com.